Prime Minister and Minister of Defense Netanyahu visits the Commando Brigade exercise, meets soldiers taking part. Prime Minister and Minister of Defense Binyamin Netanyahu on Tuesday visited the Commando Brigade drill with IDF Chief of Staff Lt. Gen. Gadi Eizenkot and other senior officials. 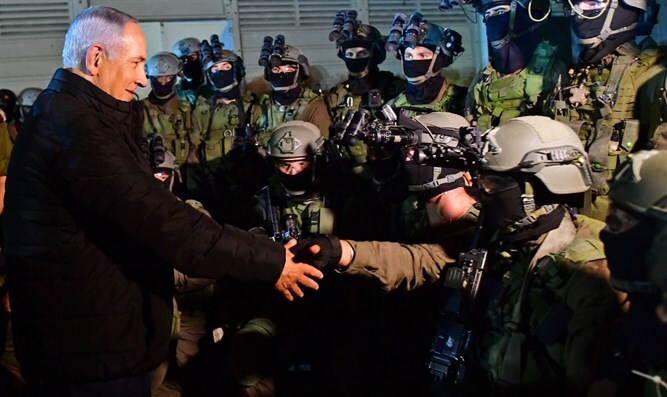 During the drill, Netanyahu was briefed by the Chief of the Staff, Lt. Gen. Eizenkot, the head of the IDF's Commando Brigade Col. Kobi Heller, and other senior officials. Netanyahu later held a discussion with the fighters participating in the exercise. Netanyahu told the soldiers, "The biggest correction to anti-Semitism is the State of Israel and the Israel Defense Forces. Once upon a time, we were a leaf blowing in the wind and anyone was able to massacre us. Today we have the power to respond." "We are on the eve of Hanukkah, the spirit of the Maccabees is here - you are the Maccabees. We overcome our enemies with extraordinary strength and in an extraordinary spirit that I see here, I see in the IDF and in all our fighters. I am proud of you and believe in you and the people of Israel believe in you. Keep up the success, protect the state, take care of yourself and take care of each other," added Netanyahu. The Commando Brigade is currently holding a ten-day exercise in different parts of the country. The exercise is meant to practice a variety of scenarios.